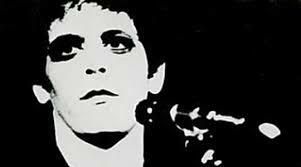 “When Lou Reed sings, a child somewhere dies.” This horrible statement, attributed to our good friend Matthew R, has a black truth in it (like all good and unfair epigrams). Reed’s records were not for everyone and definitely not for children. Jewish, polysexual, extremely troubled as a youth (his parents committed him to shock treatment at a psychiatric hospital when he was 17) and artsy, he spurned the comfortable Long Island existence and devoted himself to his trade. With some diversions, that is: incredibly, after the release of the Velvet Underground’s Loaded, he was working as a typist at his father’s tax accountancy firm and living with his folks in Freeport; this after several years with the Velvets, Andy Warhol et al and just a year before Transformer! Though his singularly depraved subject matter and casual style seem at times affected, he was uncompromising and unique. His songs could be hauntingly sad (“Perfect Day“) or belly-laugh funny (“I want to be Black”). They could be social commentary or sneer. Many of them were poems of marginal people with very modern problems. They took as long as he liked: he thought nothing of cutting tracks that went on and on, like an acid trip. 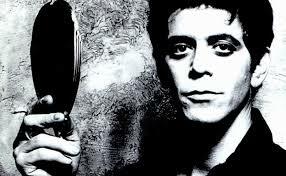 Lou Reed wrote drug or drug-infused songs before anyone and his are still the best: “I’m Waiting for the Man”, “Heroin”, “White Light White Heat”, “I Heard her Call My Name”, “Walk on the Wild Side“, “Street Hassle”. There was a voluptuous excess in his songs that still galvanise, despite the production tricks and purple prose (e.g. “The Blue Mask”). His best songs essay sickness and pain, in which he could be dazzlingly sensitive and astonishingly savage. The VC’s favourite Lou albums are: “The Bells”, “Berlin”, “Coney Island Baby”, “Transformer“. And a special mention for “Metal Machine Music”, a great way of getting unwanted guests to leave the party, with its hysterical liner notes, including the quip “My week beats your year” and of some late, great songs: “I Believe” (“Songs for Drella”); “Power and Glory” (“Magic and Loss”); “Baton Rouge” (“Ecstasy”); “Who Am I?” (“The Raven”); his great, weird version of Peter Gabriel’s “Solsbury Hill” and “Junior Dad” (“Lulu”). Best live stuff: a sleepy, foggy, late night “Sweet Jane” from 1969; a speed of light “White Light White Heat” (“Live in Italy”); “Vicious” (“Perfect Night in London”), “Rock & Roll” (“Rock & Roll Animal”) and a torch-song “Berlin” (“Take No Prisoners”). Great obit. Saw Lou live several years ago and thought he was the coolest man on the planet. Lou was my all time favorite, grew up on his music, saw him at Massey Hall in Toronto late 70's great show. I was such a fan my nick name was "Lou" on the Barrie Central football team. Hmm mm Lou wrote a song about that.